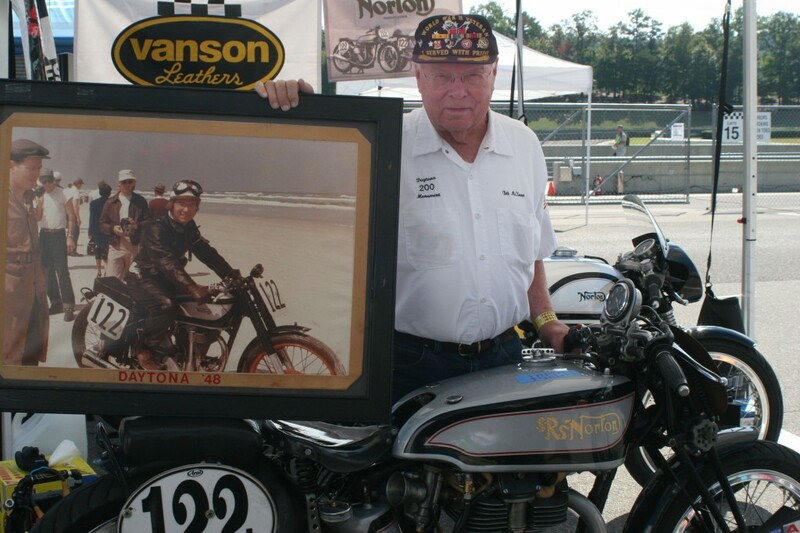 This is a picture of Bob McKeever at Barber Motorsports Park Vintage Days standing behind his 1937 Norton Manx campaigned by Alex McLean, holding a picture of himself as a participant in the Daytona Beach race in 1948. He finished 14th on a borrowed 1948 Norton Manx. Norton had sent over 25 bikes which were dispatched to different dealerships. George Taylor received 2 of them and had one from the previous year – so he had 3 which he campaigned. He approached Bob to campaign one of them, which Bob put in the trunk of his car and headed to Daytona. 155 motorcycles started in that race, and only 45 finished. Bob won $75 which he split with George. If you look closely at the image, you will see that the front rim is painted orange – they painted it without taking it off the bike in order to be able to make it more easily identifiable.